You can use Denodo to create simple APIs based off nearly any data source. Instead of architecting an application around a difficult data source, you can build a Denodo API to suit an application. See below for potential use cases and details about creating an API with Denodo. An app needs a simpler RESTful interface to data, instead of a JDBC or ODBC connection. An app needs to combine data from multiple sources. An app needs data from sources that are difficult to access or parse, such as cloud sources (for example, AWS or Azure), cubes, Hadoop, LDAP, SFTP, Excel files, flat files, or other APIs. Existing application APIs do not meet application specifications because of inflexible output format, inability to accept filters or criteria, missing data, or data format issues. Use an API to circumvent native APIs, so data are provided with the proper filter and in the required format. Use an API to expose tables as a RESTful API, cutting down on the overhead and complexity of direct database calls while providing a filter and output that meet specifications. Use an API to seamlessly union or join an Excel file on Box, NPM, or Github with relational databases. Use an API to query the ADS through LDAP, and return the members of a group or an individual's groups. 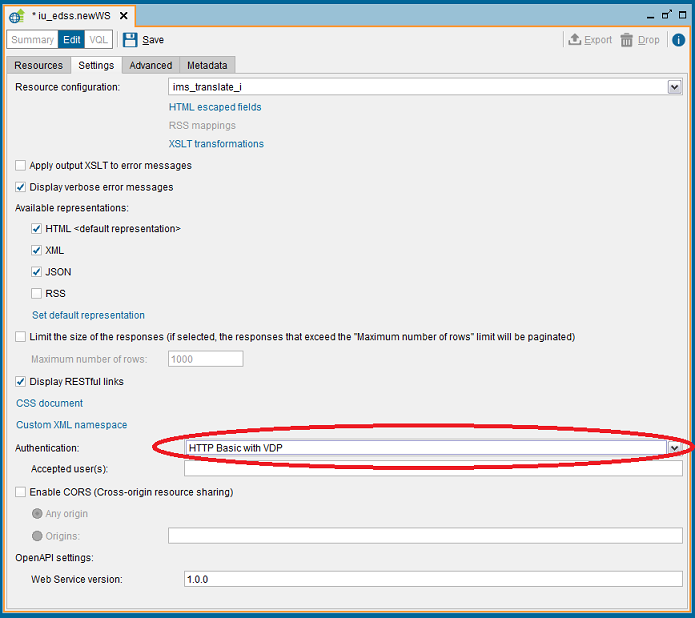 Use an API as a proxy for SFTP transactions. All Denodo views are automatically and securely exposed through a default API. Before creating a new RESTful web service, access the default Denodo web service to check whether it is adequate. Replace <-environment> with -dev for the DEV environment or -stg for the STG environment, or omit <-environment> for the PRD environment. Replace <your_VDB_name> with the appropriate VDB name. Replace <your_view_name> with the appropriate view name. To retrieve the information in a different format, without pagination, you can append strings (such as ?$format=XML or ?$format=JSON) to the URL. 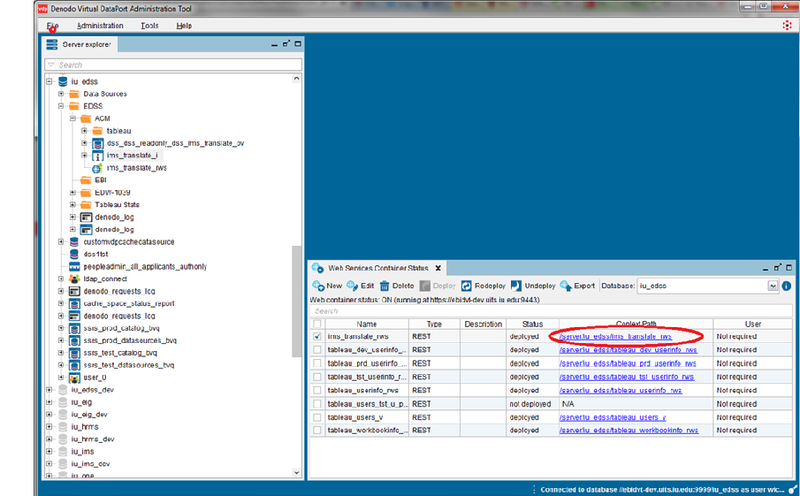 You also can query the data through the default web service. Resources: Lists the view published by the web service. 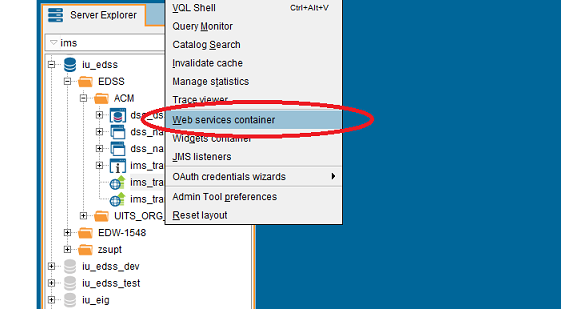 This tab will be automatically populated with the attributes of the view you selected to create your REST web service. 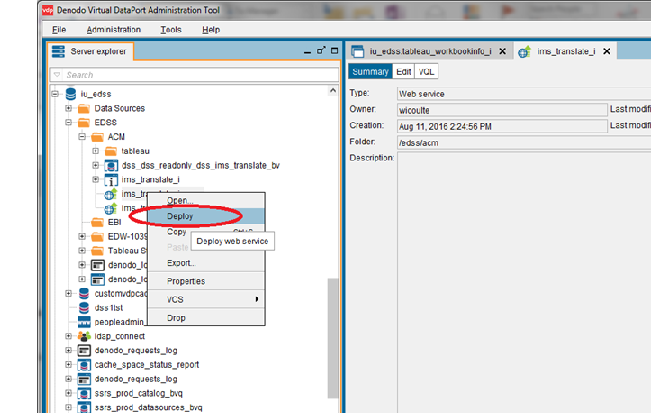 Advanced: Manages the parameters of the connection between the web service and the Virtual DataPort Server. Accept the default settings on this tab. Metadata: Accept the default settings on this tab. 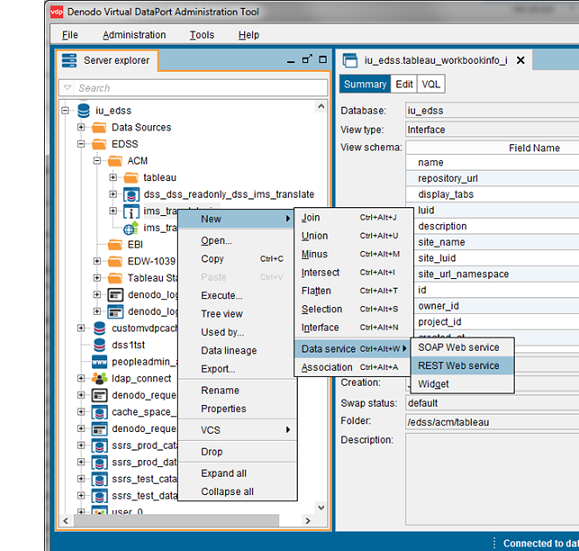 When you're presenting data in HTML format, Denodo will paginate the output. Formats other than HTML will not be paginated. This is document amto in the Knowledge Base. Last modified on 2019-03-12 08:40:05.